Northern Ireland produced a second half comeback to stun Gibraltar and come from two goals down to win 3-2 in an action packed match at the Tercentenary Sports Hall. After losing their opening game on Saturday 3-0, Gibraltar came into the game hoping to get revenge. The early stages were a very even contest with both keepers called into action. As the game went on, Tiffany Viagas started to see more of the ball and was pulling the strings in all of Gibraltar’s attacks. Halfway through the first half and Gibraltar broke the deadlock through Kayleigh Ferro. Gibraltar goalkeeper Caitlin Robba made a good save shortly after, to keep out a shot from Olivia Brown. 17 minutes played and Gibraltar doubled their lead, Shania Robba drawed the keeper off her line and squared the ball for Joelle Gilbert to smash in from close range. 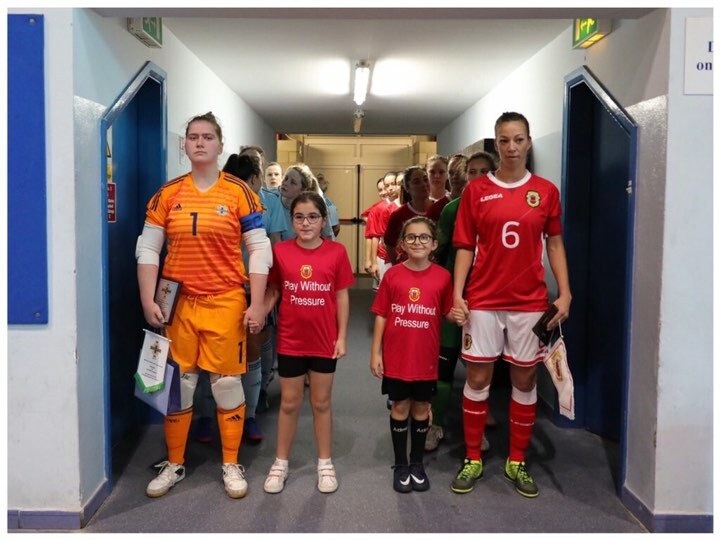 The hosts were awarded two penalties in the final minute of the first half, Kayleigh Ferro hit the first one over the bar while Joelle Gilbert’s hit the post and the Northern Ireland keeper Alice Harkness showed great reflexes to keep out Tiffany Viagas’ rebound. After a relatively even start to the second half, Shania Robba nearly made it 3-0 for Gibraltar but Harkness made an excellent save to keep out. Four minutes later, Caitlin Robba made another great save to keep out a close range shot from Mairead McCann. A minute later, Northern Ireland pulled a goal back as Hannah Henderson bundled the ball over from a corner. Playing again in less than 24 hours really took it’s toll on Gibraltar as two late goals from Olivia Brown secured the visitors a 3-2 win. Conclusion: This weekend would have definitely been what the Gibraltar women’s team would have hoped for going into the games. Two losses but two excellent performances – from the experience of Keisha Doody, the technical ability of Tiffany Viagas and the goalscoring prowess of Kayleigh Ferro, the foundation has been laid down for what looks to be an exciting new chapter in Women’s football. This entry was posted in Futsal, International, Women. Bookmark the permalink.